Published: Jan. 30, 2013 at 10:51 a.m. The fantasy value of wide receivers has increased in recent seasons, so it's no shock that three of the past eight Super Bowl MVPs are wideouts. The last came in 2009, when Santonio Holmes hauled in nine passes for 131 yards and recorded what will be one of the greatest touchdown catches ever in the big game. A total of six wideouts have won the award overall, and 26 have recorded 100-plus yards in the 46 championships. In the third part of our series that combines Super Bowl success and fantasy football, we'll look at the top 10 wide receiver performances in the planet's ultimate game. Considered the greatest wideout ever, Rice had 10 receptions for 149 yards with three touchdowns - the second time he scored three times in the big game - and scored 33.9 fantasy points in a 49-26 win over the San Diego Chargers. Rice wasted little time, scoring on a 44-yard pass from Steve Young just three plays into the contest. Rice and the 49ers blasted the Denver Broncos 55-10 to capture the franchise's fourth Super Bowl title. While it was Joe Montana who took MVP honors, Rice went off for seven receptions, 148 yards and three touchdowns. 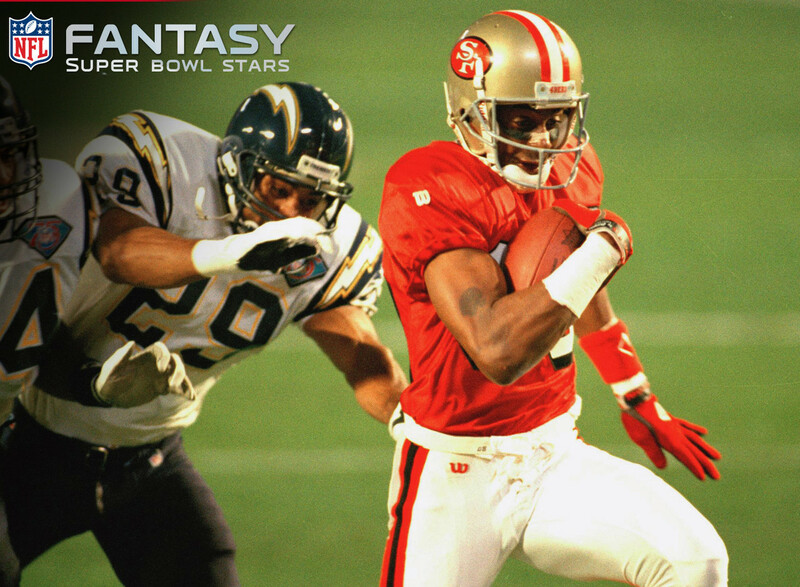 The Hall-of-Fame wide receiver scored on catches of 20, 38 and 28 yards and finished with a solid 32.8 fantasy points. Rice would have owned the top three performances had it not been for Sanders. He posted nine catches for what was a record 193 yards, scored two touchdowns and finished with 31.3 fantasy points in a win over the Broncos. Sanders averaged 21.4 yards per reception and found the end zone on passes of 80 and 50 yards from Doug Williams. Even with a sore ankle, Rice still made mincemeat of Cincinnati's defense in a memorable 20-16 win. He recorded 11 receptions, established a record 215 receiving yards, found the end zone on a 14-yard pass from Montana and finished with 28 fantasy points. Rice has scored more touchdowns than all non-quarterbacks in Super Bowl history. In the oldest performance to make our top 10, McGee caught seven passes for 138 yards and scored two touchdowns in a 35-10 win over the Kansas City Chiefs. He caught four passes in the regular season, but was called into action to replace an injured Boyd Dowler. McGee scored on passes of 37 and 13 yards and finished with 25.8 fantasy points. Fitzgerald finished a record-setting postseason with a monster stat line in Super Bowl XLIII, putting up seven catches for 127 yards and two touchdowns in a loss to the Pittsburgh Steelers. He found the end zone on passes of 1 and 64 yards from Kurt Warner, and finished with an impressive 24.7 fantasy points. The Packers fell short of a second consecutive Super Bowl title in a 31-24 loss to the Broncos. Freeman put up big numbers, though, recording nine catches for 126 yards with two touchdowns and 24 fantasy points. His scores came on passes of 22 and 13 yards from Brett Favre, who outperformed John Elway but couldn't take home a win. Irvin had the best statistical performance of his three Super Bowl appearances with six receptions, 114 yards and two touchdowns in a 52-17 romp over the Buffalo Bills. The Playmaker scored on catches of 19 and 18 yards from Troy Aikman, and would finish with 23.4 fantasy points. Dallas earned its third title in six Super Bowl appearances. Stallworth recorded just three receptions in the Steelers' 35-31 win over the Cowboys, but he made them count. He had 115 yards and two touchdowns, one of which came on a 75-yard strike from Hall of Famer Terry Bradshaw. Stallworth, who scored his first touchdown of the contest in the first quarter, finished with 23.5 fantasy points. In a forgettable Super Bowl for Cowboys CB Mark Washington, Swann made some of the most acrobatic catches ever seen in the Steelers' 21-17 win. He had four receptions for what was a record 161 receiving yards, one touchdown and scored 22 fantasy points. Swann, who earned MVP honors, found the end zone on a long 64-yard strike from Bradshaw.